There are few characters more iconic than Sherlock Holmes. He is a figure strongly ingrained in the pop culture psyche, wearing his deerstalker hat while sporting a pipe and magnifying glass. When British director Guy Ritchie was announced to be helming the current incarnation of the most famous detective, I wasn’t to intrigued. Since 2002’s Swept Away, Ritchie has seemed to be unable to find direction in his film career. With Sherlock Holmes he has managed to combine his dynamic visual storytelling style with plenty of humor to create an incredibly fresh twist on the icon. The plot is not based on any particular Holmes’ tale, but references many characters and cases familiar to those who have read the stories. Holmes and Watson have just helped Inspector LeStrade apprehend Lord Blackwood, a member of the House of Lords involved in a satanic Illuminati ritual. Blackwood tells Holmes of a larger power at work before he is hung and appears to return to life. While Holmes attempts to uncover the truth behind Blackwood he must deal with Watson’s impending engagement and the return of his greatest adversary and infatuation, Irene Adler. What Ritchie has effectively done is make a buddy cop movie set in the London of the late 19th century. The dynamic between Holmes and Watson is much different than previously presented and feels much more in tune with Sir Arthur Conan Doyle’s intent. 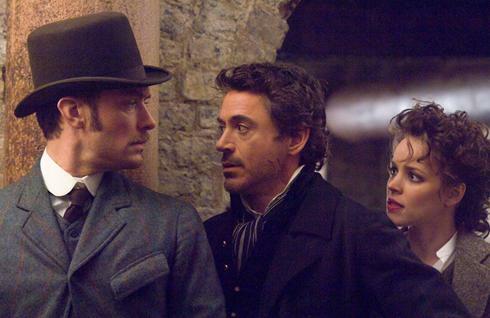 They are a bickering married couple, with Holmes blatant jealous and worried over the idea of Watson leaving him to marry his fiancee. Ritchie also brings in Holmes’ past as a boxer, as aspect of the character greatly ignored in the previous interpretations. What surprised me the most was how funny the film is, and because of that it should be classified much more as a comedy than anything else. I came to the realization that Robert Downey, Jr. is a good actor but what he’s been asked to play for the last decade or so is a pastiche of himself. Other than an accent there is not much difference between how he plays Holmes and Tony Stark. What I enjoyed wasn’t necessarily his acting, but rather his ability to do what he does so damn well. The film is definitely a fresh look at the icon of Sherlock Holmes. Anyone who holds the traditional film portrayal, first seeded by Basil Rathbone, will find this to be quite jarring. For audiences who are ready for a new take, it is one of the most fun films they will see this year. And in the case of any good studio franchise, they leave this one open for an inevitable sequel.